During the winter season, our hours are dependent on temperatures and players so please call ahead before you head over to be sure the course is open. Learn more about the facilities at Knights Play. Knight's Play has been recognized by the Golf Range Association of America as one of the top 100 practice facilities in the country. Our Raleigh golf course was designed by David Postlethwait. Knight's Play Golf Center features 27 well-sculpted holes that are sure to challenge players at all levels. The course is fully paved for carts, but short enough for a very enjoyable walk. Knight's Play has three tees for each hole to accommodate advanced, intermediate, and beginner players. 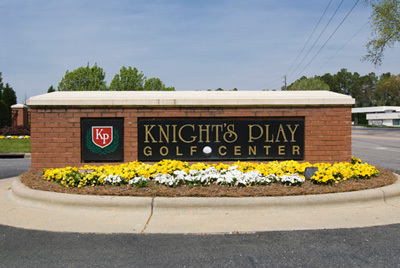 When it comes to Raleigh golf, there is no better facility than Knight's Play Golf Center! Raleigh Golf Day or Night! Also, stop by our full-service clubhouse for all your golfing needs. Visit our fully-stocked Pro Shop featuring all major brands of equipment and apparel. While you're there, enjoy delicious food at our Clubhouse Grill for breakfast, lunch, dinner, or a snack! A Broad Range of Clinics! From Pee Wee (ages 7-10), Juniors (11-14), to Ladies Clinics, we have the right fit for you or someone you know. Purchase as a gift and surprise someone or treat yourself to some Apex golf! We also close at 4PM on Thanksgiving Day, December 24 and New Year's Eve.